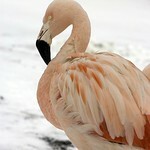 With tall, thin legs and a long, flexible neck, the Chilean flamingo can reach up to 40 inches in height. 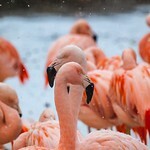 Like all flamingos, it has striking pink plumage, including crimson highlights along the edges of the wings. What appears to be the bird's knee is actually its ankle—the joint bends backward rather than forward. Not threatened. 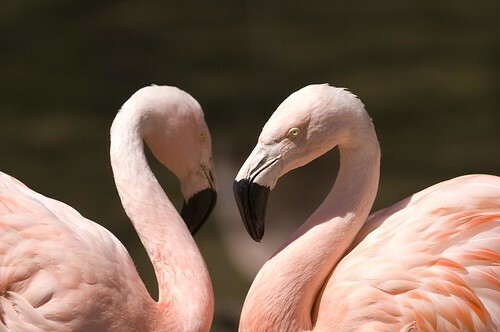 Lincoln Park Zoo participates in the Chilean Flamingo Species Survival Plan®, a shared conservation effort by zoos throughout the Association of Zoos and Aquariums. Coastal mudflats, estuaries, lagoons and salt lakes. Chilean flamingos can occupy habitats ranging from sea level up to 14,000 feet in the Andes. Their ability to tolerate extreme conditions makes them well suited for Chicago's harsh winters. The Chilean flamingo's bill is equipped with comb-like structures that enable it to filter food—mainly algae and plankton—from the water. 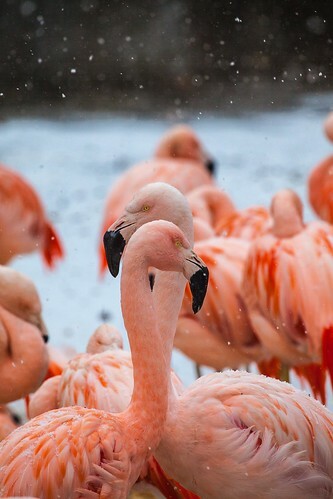 Chilean flamingos live in large flocks in the wild and require crowded conditions to stimulate breeding. During breeding season, males and females display a variety of behaviors to attract mates, including head flagging—swiveling their heads from side-to-side in tandem—and wing salutes, where the wings are repeatedly opened and closed. Males and females cooperate in building a pillar-shaped mud nest, and both incubate the egg laid by the female. Upon birth, the chicks have gray plumage; they don't gain adult coloration for two-three years. 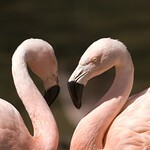 Both male and female flamingos can produce a nutritious milk-like substance in their crop gland to feed their young. 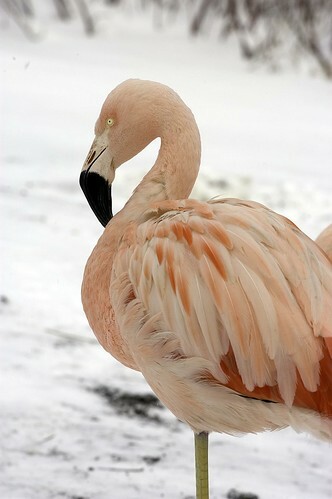 The Chilean flamingo often stands on one leg, tucking the other beneath its body to preserve body heat. After a winter spent growing behind the scenes, Lincoln Park Zoo’s Chilean flamingo chicks stepped out with their flock for the first time this week. Once a year, the Chilean flamingos at Lincoln Park Zoo receive routine medical checkups. Enjoy a photo slideshow of the zoo’s lead vet making a flamingo house call.